New regulations recently mandated by the Occupational Safety and Health Administration (OSHA) for new crane operator certification have caused a sharp increase in demand for the services of crane safety and training companies, according to an article in American Crane & Transport (ACT) Magazine. According to OSHA’s ruling, employers are required to train operators as needed to perform assigned crane activities, evaluate them, and document successful completion of the evaluations, effective December 9, 2018. Crane operators who were evaluated prior to that date will not need to be reevaluated, but by February 7, 2019 employers must document when the evaluations were completed. Additionally, crane operators must be certified or licensed, and provided with updated training as new equipment becomes available. Operators can be certified based on the type and capacity of the crane or by type only. This allows more accredited testing organizations to be eligible for the certification program. ACT Magazine reached out to Ted Blanton of NACB, Inc. for the article. NACB (North American Crane Bureau) provides crane operator training, certification and inspection services, plus crane simulation training. Blanton said that many crane companies delayed the certification of their operators, but NACB is seeing a hard push for Mobile Crane Operator Certification. The demand is so high that NACB has had to train additional NCCER examiners to fulfil the needs of their clients. Simulator-based and virtual reality training is becoming more accessible. Much like flight simulators for airline pilot training, simulator training for crane operation puts the trainee in the cabin with controls at hand. NACB Interactive Educational Systems (NACB-ies, Inc.) allows the user to build their own exercises and difficulty levels, according to Blanton. Challenges such as contact with power lines and simulated overload situations — including increased radius, telescoping out or booming down – can be addressed without actual danger to the operator. The article in ACT Magazine can be found here. 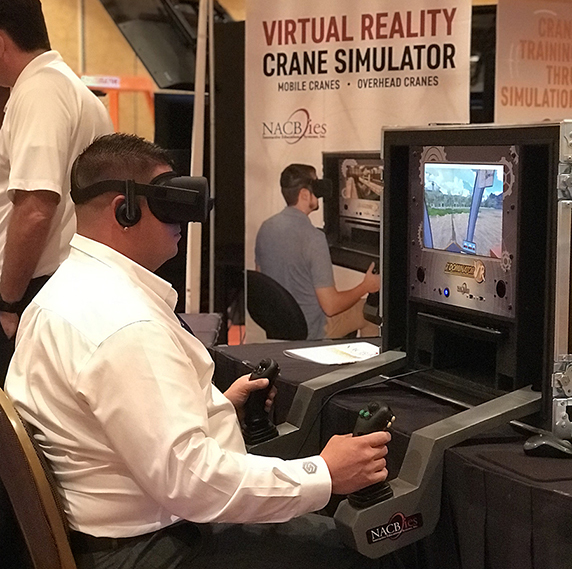 Click here for details about the NACB-ies, Inc. Portable Desktop VR Crane Simulator. Image above provided by NACB, Inc.
OSHA’s final ruling on crane operator simulation can be read by clicking here.